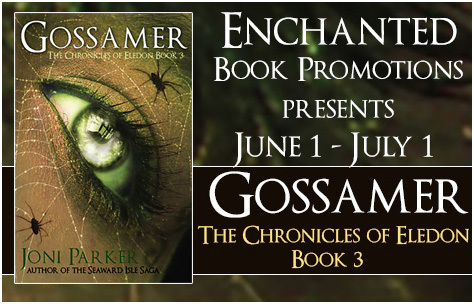 I’m hosting the starter day party today for the book tour for epic fantasy “Gossamer”. Enjoy the tour! Lady Alexin, Eledon’s Keeper of the Keys must continue to prove her powers when her grandmother, Lady Lestin and her friend, Lady Opaline of the Gossamer Elves are kidnapped by rebels and held for ransom. Alex attempts a daring rescue, only to discover that there is far more to this plot that she immediately suspected and the betrayal extends to the highest levels of the High Council of Elders. Threatened by rebel factions, suspected by Council members and under attack by deadly spiders, the young warrior has only her wits, her fighting skills and the powers of the Keys to help her. But will they be enough to save them all?